While the rest of humanity has been embracing healthy eating or even the dreaded “dry January”, as 2014 getting underway, I seem to have been embracing the world of fried food and cocktails (not necessarily directly paired) with renewed vigour. 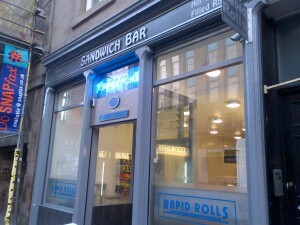 Today’s manifestation of that took me to Rapid Rolls, on Fountainbridge. I suspect the breakfast roll thing is largely down to the dark and stormy mornings, where every last moment of sleep seems precious, with a mad dash and breakfast on the run the preferred pre-work ritual. From a modest takeout shop, with just a few shelf seats for folk to linger, Rapid Rolls, somewhat like Speedy Sandwiches, is one of those places that does what it says on the tin. The rapidity of the cheery counter woman, as she assembled the black pudding and bacon for my roll, was impressive. Once she’d topped things with brown sauce, I was on my way. Total time in the shop = under a minute. 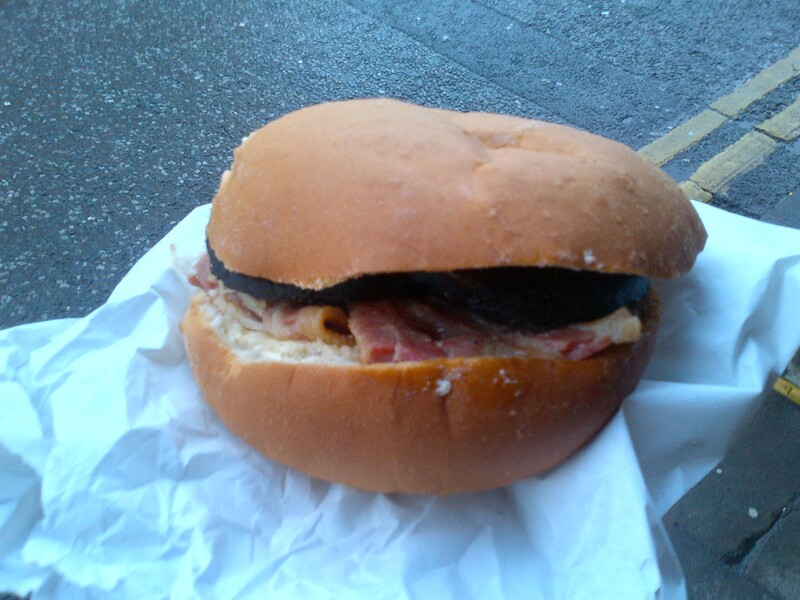 Although the black pudding had a slightly dry texture, there was a good amount of both it and the salty back bacon, making the roll a substantial item. It wasn’t the most impressive roll I’ve sampled, but it did the job rather effectively. So overall, I was impressed by the simplicity and speed of Rapid Rolls. The quality could be improved, but for a filling morning eat, it was just what was required. Do pop in, next time you’re passing.